The activity is centered primarily on startups that have already shown promise — not the early stage players. Overall investment into travel tech skyrocketed in 2015, with $5.2B in funding raised across 348 deals to private companies in the space. As travel tech booms, corporate investors — including Tencent, Google, and BMW — are taking note. When taking a more granular look at the investment total, we see how corporate involvement has grown. The amount of dollar funding that involved corporates and corporate venture capital groups more than doubled in 2015, and the count of deals with their participation increased 29% year-over-year. We used CB Insights data and analytics to dig into financing history, deal and dollar share, and the most active corporates and CVCs investing in the travel tech sector. We defined travel tech as tech-enabled companies offering services and products focused on tourism, including booking services, search and planning platforms, on-demand travel, and recommendation sites. Car-hailing services are excluded. In 2015 year-to-date through 12/23/15, corporates and CVCs poured money into travel tech, participating in 66 deals involving $2.2B invested (and a projected $2.3B and 68 deals in 2015). 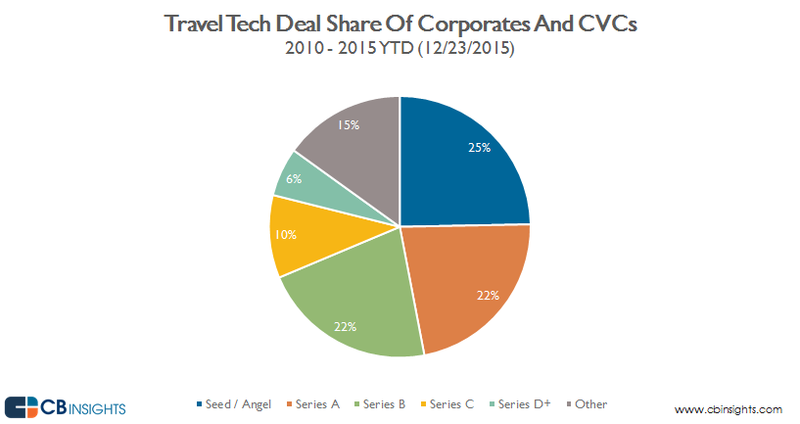 Funding to travel tech involving corporate investors grew steadily from 24 deals and $201M in 2013, to 51 deals and $987M in 2014. The growth in 2014 over 2013 represents an 113% increase in deal activity and 390% increase in dollars invested through deals involving corporates and CVCs. The quarterly pattern shows just how much funding jumped in the most recent quarters. In Q3’15, the financings participated in by corporates reached an all-time high of $1.2B in funding. It’s worth noting, funding involving CVCs and corporates for Q3’15 was buoyed by the $967M round in LY.com. The second-highest funding total was reached in Q2’15, when there was $535M in funding involving corporates. On a quarterly basis, 4 out of the last 5 quarters have each seen more than 14 deals involving corporates, with Q2’15 reaching a record high of 25 deals. Since 2010, 47% of travel tech deals involving corporate investors have been early-stage deals (Seed/Angel or Series A), while 32% were mid-stage (Series B and C), and 6% were late-stage deals (Series D+). The majority of deals in the “other” category were corporate minority investments such as Expedia’s stake in Decolar. 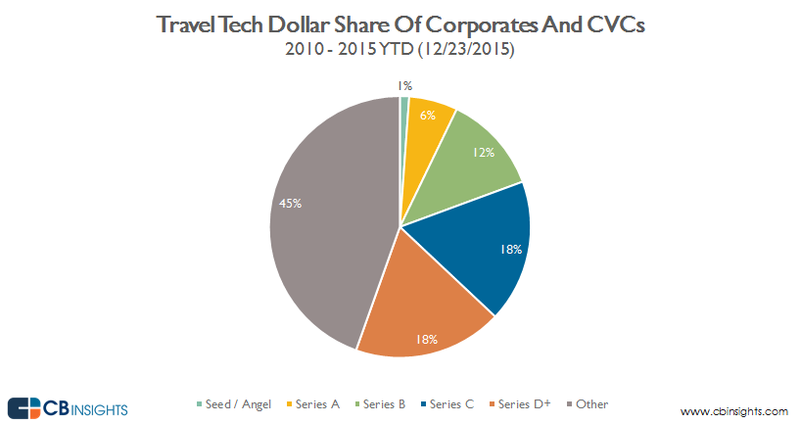 30% of travel tech dollar share involving corporate investors was accounted for by mid-stage deals (Series B and Series C). Early-stage (Seed/Angel or Series A) dollar share was 7%. Late-stage (Series D+) dollar share was 18%. 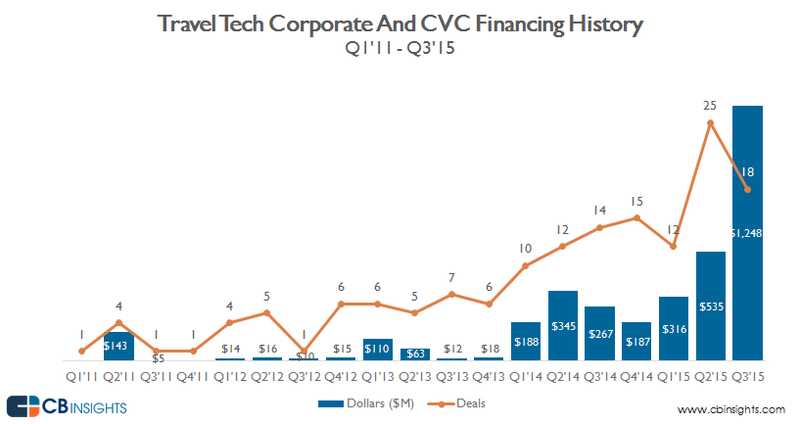 Tencent was the most active CVC or corporate investing in travel tech startups. Some of their investments include Chinese booking services LY.com and lvmama.com, among others. The next spots were taken by Concur, followed by a two-way tie for the number 3 spot between Recruit Strategic Partners and Google Ventures, see below. This story is reprinted with the permission of CB Insights, where this story originally appeared.